A desk space can make or break your productivity. Personally, I've really learned to love decorating my desk nicely, because it makes it easier for me to sit there and get stuff done when it looks nice! I wanted to write this post going into detail about how I've created a nice, cohesive desk space that stays clean and organized. 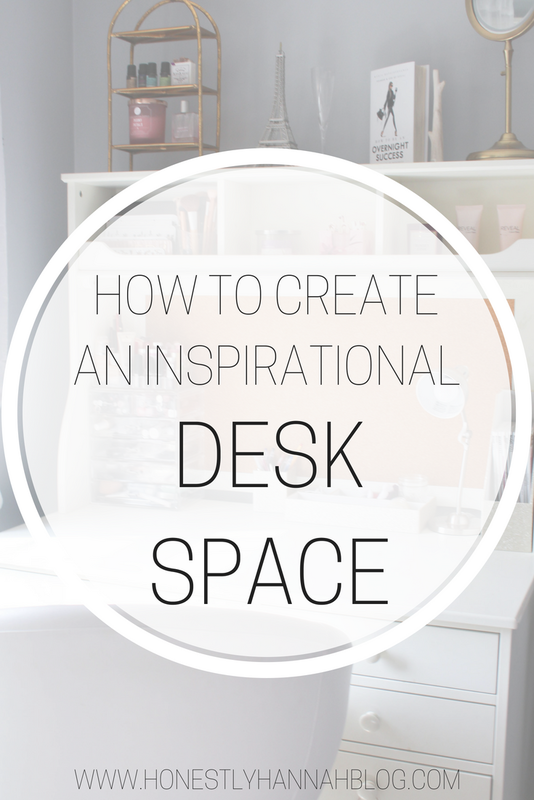 Keep reading for the best tips for creating an inspirational desk space! 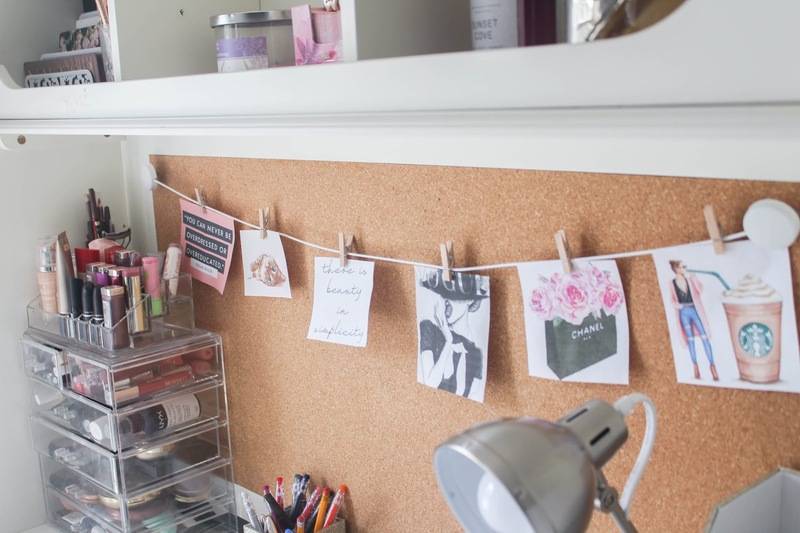 Having too many things on your desk can make it look cluttered. No matter how cute the pieces are, if there's too much going on, the space isn't going to feel inspiring. It's best to stick with simple decor on your desk area. This cute desk organizer would be a great piece to add to your desk space since it's practical (great for storing pens and other desk materials) and simple at the same time! I don't think I'm the only one out there that keeps my makeup on my desk (or maybe I'm weird), but I love having my makeup on my desk for easy access as well as being able to sit there and do my makeup in the morning! However, I don't know what I'd do without my makeup organizer. Things would get so chaotic. 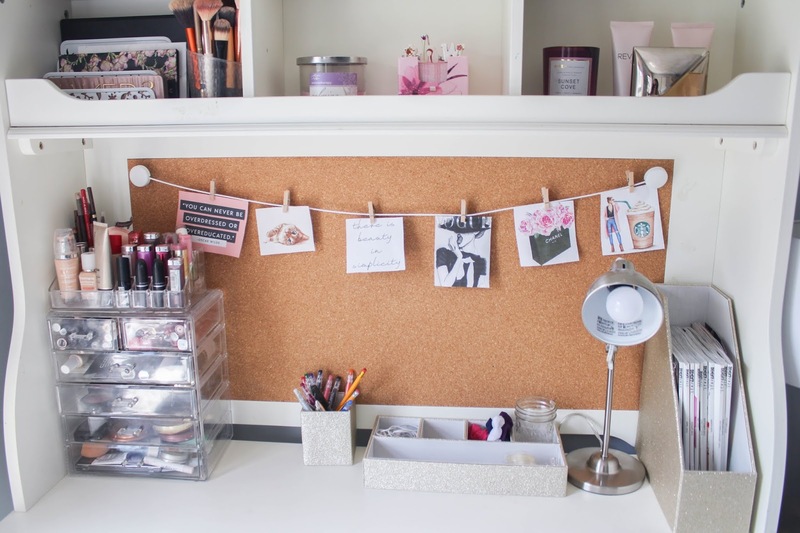 Keeping everything in one place keeps me from getting makeup everywhere, and ensures that my desk still look organized, even if I do have all my makeup stored on it. One of my favorite additions to my desk space with my photo string. I printed out some cute images and quotes from Pinterest and hung them up, adding a nice touch to the simple space. I love that it adds a nice aesthetic! This seems obvious, but it's so easy to let you desk get out of control. Especially during the school year, I find myself throwing random things into/onto my desk all the time, so I've made a point to always clean off my desk before starting to work or study. For me, a messy area makes it hard to focus and be productive. Keeping your desk area clean when you're working and picking up after making a mess on the desk helps so much! What do you like to keep on your desk? Definitely! I literally can't function with a messy desk!